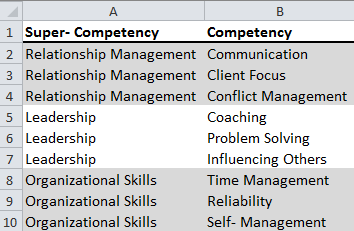 Super-Competencies allow you to group competency scores together into high level dimensions. 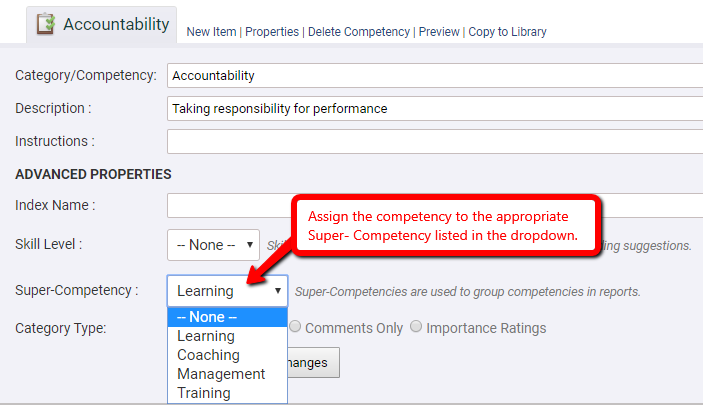 The super competencies will appear on the user dashboard and reports once they are generated. You can add a super competency report component to any of your report templates to display the overall scores in the report. Create a list that groups your competencies into Super-Competencies. You must have a minimum of two Super-Competencies. An example grouping can be found here. Send your list to the EchoSpan Support Team (support@echospan.com) and they will import the Super-Competencies into your account and send you a confirmation email. Login to your project and from the drop-down menu, select Setup >> Review Items. Click “Properties” next to a competency name. Assign the competency to the appropriate Super- Competency listed in the dropdown. Once the Super-Competencies are assigned, you will want to add the “Super- Competency Summary” section to your custom report template. Instructions for adding report sections can be found here. *Super- Competencies can be applied to Professional and Enterprise accounts.